Achieve that summer-time radiance! Apply the Living Nature golden textures and colours across the face, neck and shoulders, using the animal friendly Living Nature Retractable Face Brush. 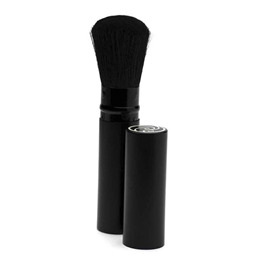 Made from shorn goat`s hair, this lovely, full face brush is perfect for applying your face powder. This lovely, full face brush from Living Nature is perfect for applying your face powder. Use the retractable brush to apply the Living Nature golden textures and colours across the face, neck and shoulders. Below are reviews of Living Nature Retractable Face Brush by bodykind customers. If you have tried this product we'd love to hear what you think so please leave a review.